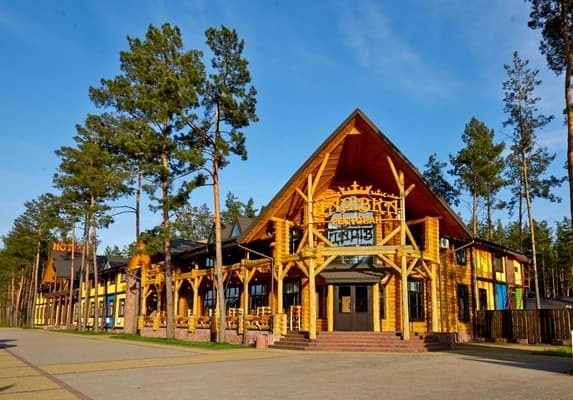 Hotel and restaurant complex "Tsarevka" is located in a pine forest on the highway Kiev-Zhitomir-Chop. 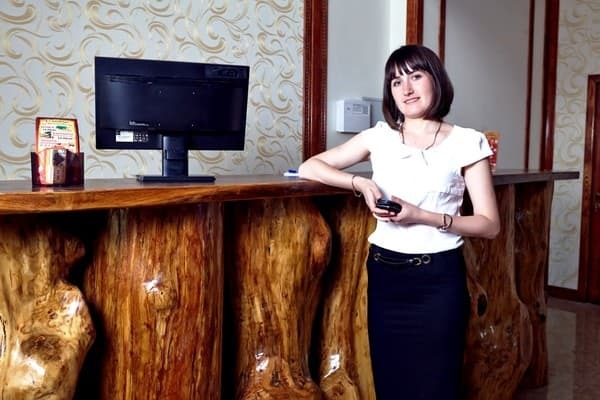 The complex has comfortable rooms of "standard" and "luxury" categories. The air-conditioned rooms are equipped with satellite TV and free Wi-Fi. Each room has a private bathroom with toiletries, a hairdryer and slippers. 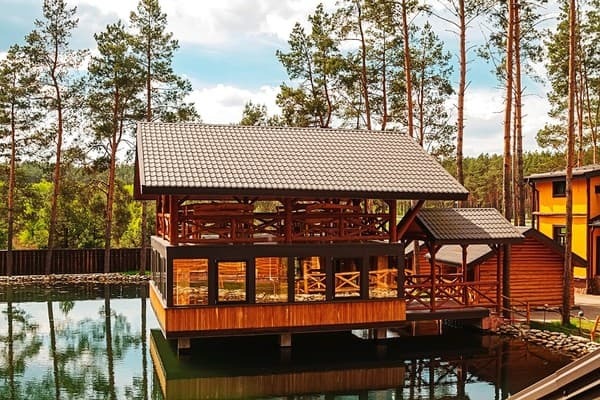 Guests can relax on a two-level summer terrace near the lake or spend time in a Russian bath with a swimming pool. The menu of the restaurant "Tsarevka" includes dishes of Ukrainian, European and Japanese cuisine. For children with children there is a mini children's playground. Free guarded parking is available on site. 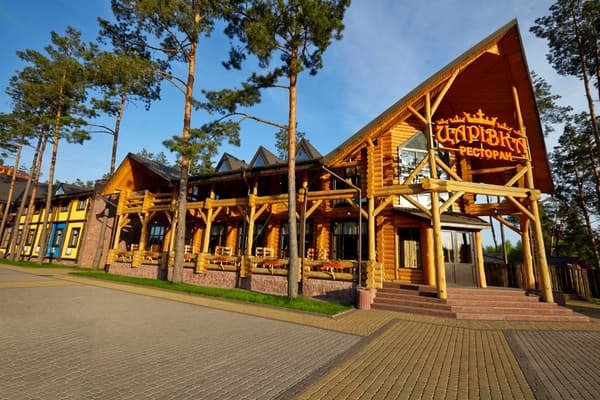 Hotel and restaurant complex "Tsarevka" is located on the 92nd km of the route Kiev-Chop, beyond the village Tsarevka, an hour's drive from Kiev. Description of the room: Comfortable room with double bed. Area of ​​the room is 18 sq.m. The windows overlook the road and the pine forest. Description of the room: The room is located on the second floor of the cottage. 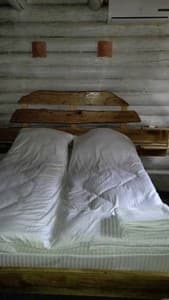 Description of the room: One room with two separate beds. Area of ​​the room is 18 sq.m. The windows overlook the road and the pine forest. 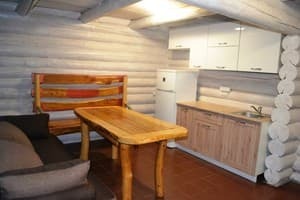 Description of the room: Two-room suite of "luxury" with an area of ​​36 sq.m. 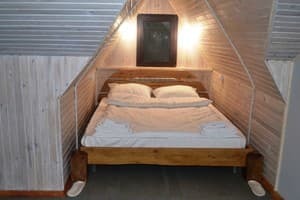 The bedroom is equipped with a double bed, a living room with a soft corner. The windows overlook the pine forest. Номер дабл у цьому готелі - це двоспальне ліжко з двома матрасами, не з одним! Фена в номері ми не знайшли, людини на рецепшені весь час не було на своєму робочому місці. Телефона немає у номері, щоб зв"язатися хоть з кимось з персоналу. Зупинилися у 10 номері і вода гаряча смерділа! Звукоізоліяції не було взагалі, тому, якщо ви з дороги і маєте чутливийц сон, про відпочинок у Царівці у номері за 330 грн і не думайте. Є рушники, але вони жорсткі і не приємні на дотик, мило і шампунь з гелем для душу. А мне все понравилось, еще раз спасибо. Children under 7 years without a separate bed are accommodated free of charge. The menu of the restaurant "Tsarevka" includes dishes of Ukrainian, European and Japanese cuisine. The complex is located on the 92nd km of the Kiev-Chop (M-06) highway, beyond the village of Tsarevka. 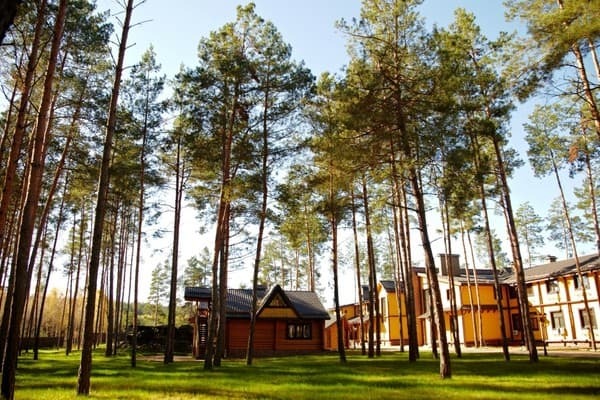 The distance to Zhitomir is 52 km, from Korostyshev to the hotel is 16 km. Geographical coordinates: 50 ° 20'53.99''N, 29 ° 15'46.60''E.